Lock in a great price for Rana Roja Lodge – rated 8.2 by recent guests! 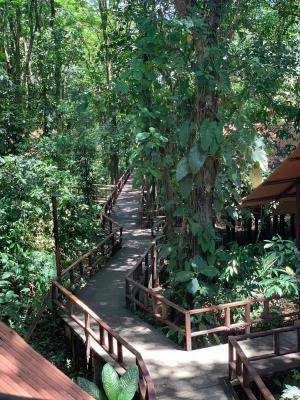 Location, breakfast, family of monkeys hanging out on the elevated walkway from restaurant to room! Such an amazing place! I can’t believe there’s something better around. In the middle of the jungle, spectacle! 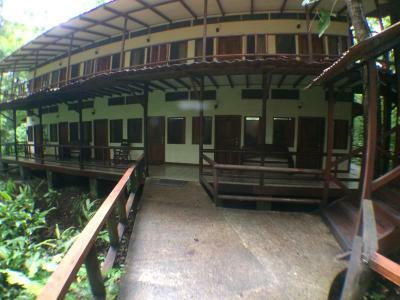 Staff, pool, terrace... all. Highly recommend! Staff was wonderful and anticipated our needs. Property was rustic but well maintained. friendly staff, helped make arrangements for excursions. 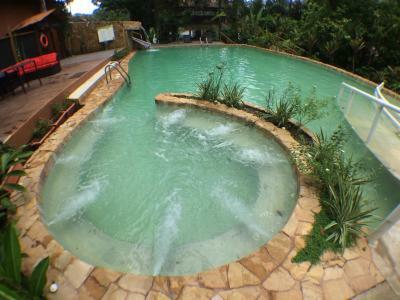 great salt water pool! It was really cool to wake up with the sound of the monkeys. We really felt in the middle of the jungle. Facilities are simple, but enough. Staff was also really friendly, especially Geraldo, the hotel manager. He gave us all the tips, organized our tours, requested boat taxis for us, etc. His customer service made all the difference and contributed for having a great stay. Monkeys from around the pool and in the resort. Also great deck along the river where you can drink a cocktail. 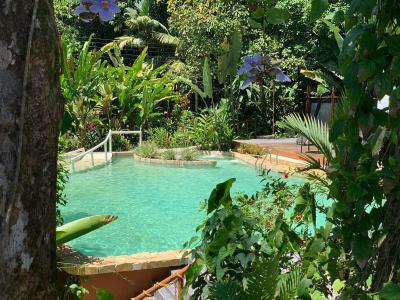 One of our top picks in Tortuguero.Featuring an outdoor pool and a restaurant, Rana Roja Lodge is located in Tortuguero. Free WiFi access is available in public areas. A balcony is featured in all guest rooms. 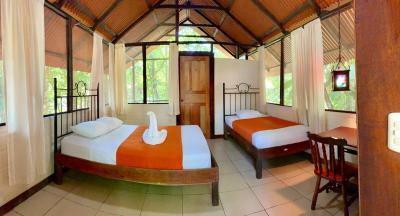 Garden views are available in each room at Rana Roja Lodge Tortuguero. Each private bathroom comes with a bath. Towels and linens are provided. 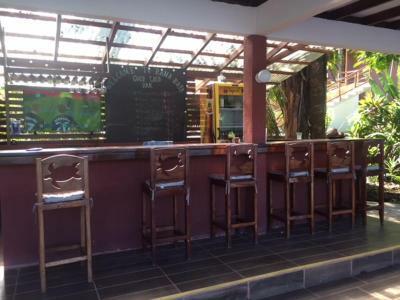 At Rana Roja Lodge you will find a garden and a terrace. Other facilities offered at the property include a tour desk. Various activities can be enjoyed on site or in the surroundings, including fishing and hiking. 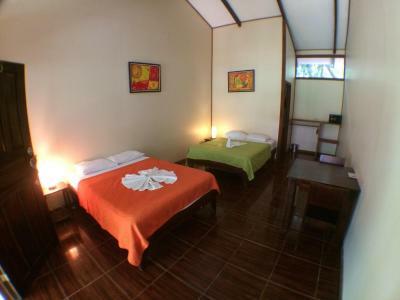 The hotel is 0.7 mi from Tortuguero National Park. 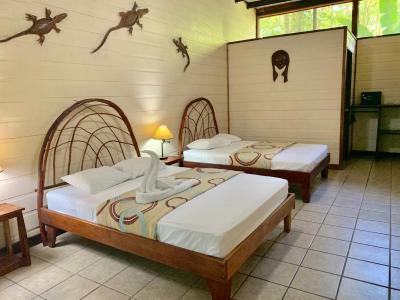 When would you like to stay at Rana Roja Lodge? This bungalow features a seating area. 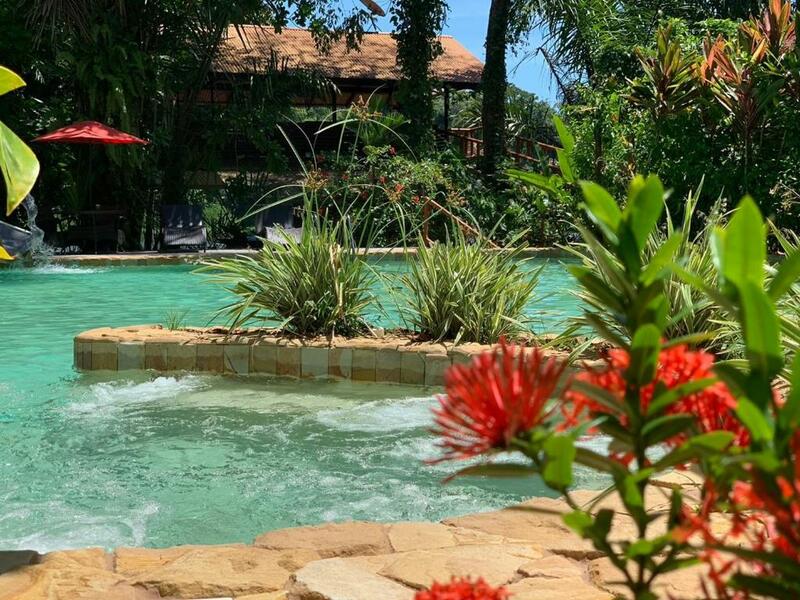 House Rules Rana Roja Lodge takes special requests – add in the next step! 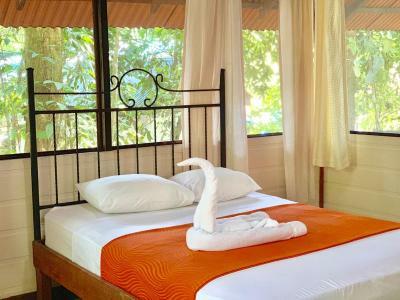 Rana Roja Lodge accepts these cards and reserves the right to temporarily hold an amount prior to arrival. The room was a bit dissapointing to be honest..its a bit to pricy for what you are getting. The owner was a fantastic host!! 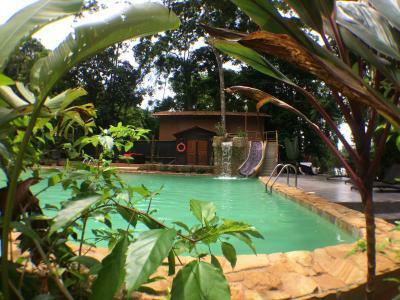 Great breakfast, pools, cabins in the middle of the jungle!! 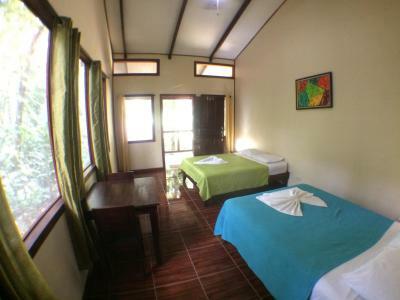 Location is fabulous, right in the middle of the jungle with nature all around. Sleeping in the cottage is a marvellous experience. Jacob and Ilsis made our stay very pleasant. 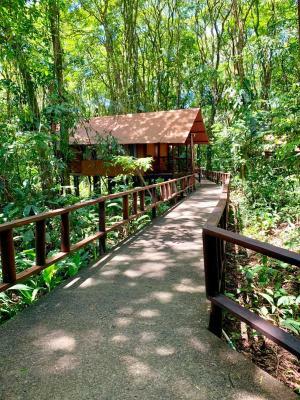 Perfect place to explore the Tortuguero park! Cold shower but our fault for not asking. 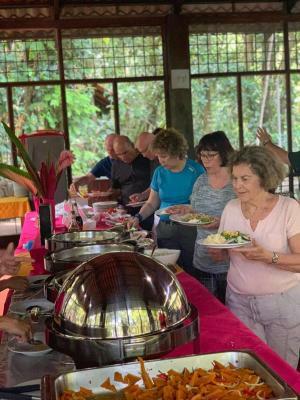 The food was fresh, cheap and locally cooked but no choice and more than 2 nights would have been monotonous (same mixed veg on both nights). There are two other hotels on either side but not sure if we could have eaten there and also buffets with the same owners, so possibly similar food. 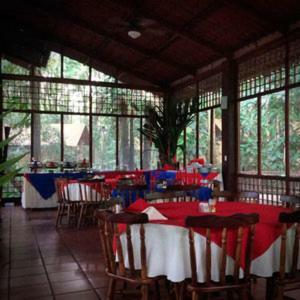 It is possible to go into Tortuguero town to eat with much more variety. The dining room is a let down, no ambience and nice lighting/candles etc. I think it could easily be made into an inviting space which might encourage more people to eat there. The great thing is it’s remote location but if you want to go out for dinner it’s a boat taxi ride away. 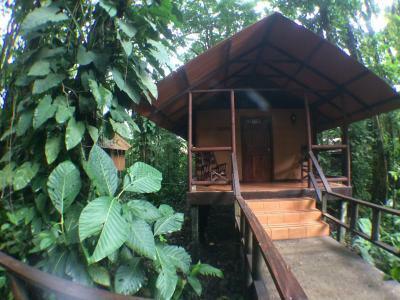 Great place to stay in Tortuguero and literally in the middle of the jungle. Quiet and relaxing, nice pool. Monkeys jumping around the place which is great to see. 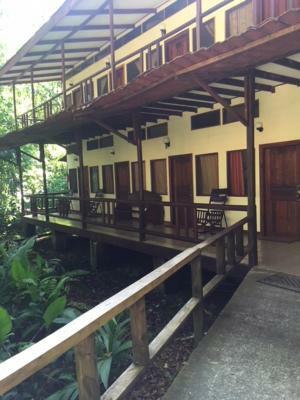 Great location set in the forest with monkeys and wildlife all around. 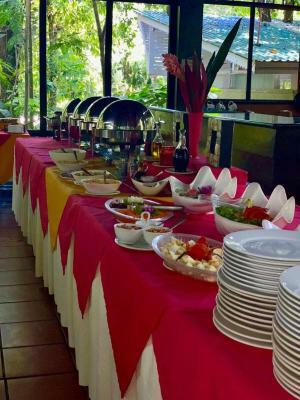 Management were very helpful, friendly and accommodating. Good bar with a happy hour! 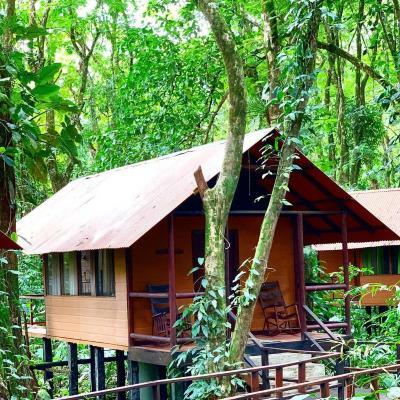 Overall a great stay where you can relax and listen to the rainforest all day! WLan only in the restaurant. Great jungle experience! 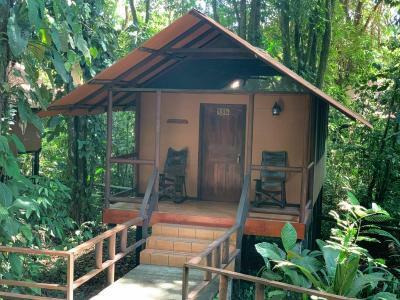 Located in the jungle with red frogs (rana roja) and monkeys. You hear all the jungle noises in the night. 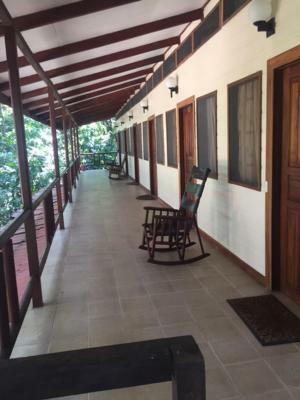 The bungalows are clean and have moskito nets. So you feel safe and comforty. The hotel manager was really nice and helped us booking tours/shuttle. Restaurant food was OK but not great. Great location and Jacob was a wonderful host, he really looked after us all. He introduced us to a great guide Alexis who we spent both days with. The grounds are beautiful and there is plenty of wildlife there. The pools are both perfect with kids. Bar is fun and laid back right on the water.